All earbuds are not created equal. The audio market is flooded with adequate Bluetooth earbuds selling for $30 or less. If you lose them it may not break your heart or your bank account to replace them. When you want to have really good sound and comfortable earbuds with a battery that won’t die in an hour or two, try re-fuel’s $100 High Performance Sports Wireless Earbuds. If you’ve been listening to your tunes on low-end earbuds, be prepared for a revelation. Skip all the technical specifications about the frequency range and response and just listen. The audio cranking though these earbuds is powerful and superbly balanced. I’ve been listening to some tunes recorded 40 and more years ago and they suddenly have a resonance and clarity I hadn’t heard before. Sound quality and separation are an easy two thumbs up. There are other features that I never see in less expensive earbuds. The Bluetooth 4.1 battery in the re-fuel earbuds recharges in only 1.5 hours. The batteries will last six hour if you’re just using it for talking on the phone or five hours if you’re listening to music at 80 percent of the volume capacity. The battery duration will be slightly less than that if you raise the volume to the max. Standby time is 120 hours, which means you don’t have to recharge them every day. I use mine during bike rides and the Bluetooth signal remained strong and constant through more than two hours. The next day, without re-charging the battery, I was able to ride and listen another 90 minutes. I used them doing chores around the house and finally gave up waiting for the battery to die. The earbuds fit comfortably at the entry to the ear canal. Three different sized tips are included. The earbuds are attached to a flat tangle-free cable approximately 20 inches long. Even if you have a neck the size of a fire hydrant, they’ll be long enough to fit behind your head and lock effortlessly in the ear. Like most Bluetooth earbuds, if you’re listening to Internet radio on a Smart Phone and a call comes in, the earbuds will interrupt the music and allow you to talk hands free. Music resumes automatically when you end the conversation. Spoken audio is excellent. The earbuds are not active noise-canceling, which is a plus if you’re using them while exercising outdoors. The speakers are so powerful that you can still override ambient noise as much as you like. 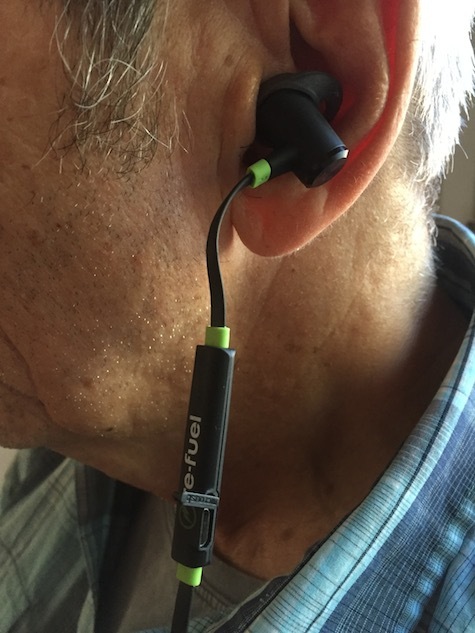 Re-fuel calls the music-listening experience “immersive” and claims the earbuds “seal in crisp highs, natural mid-tones and rich bass.” This is not an idle boast. 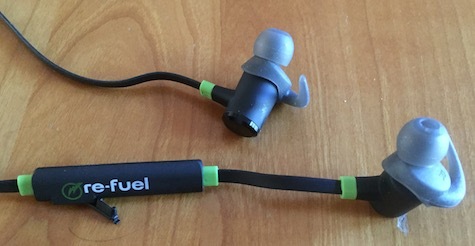 Re-fuel Sports Wireless Earbuds are highly recommended.